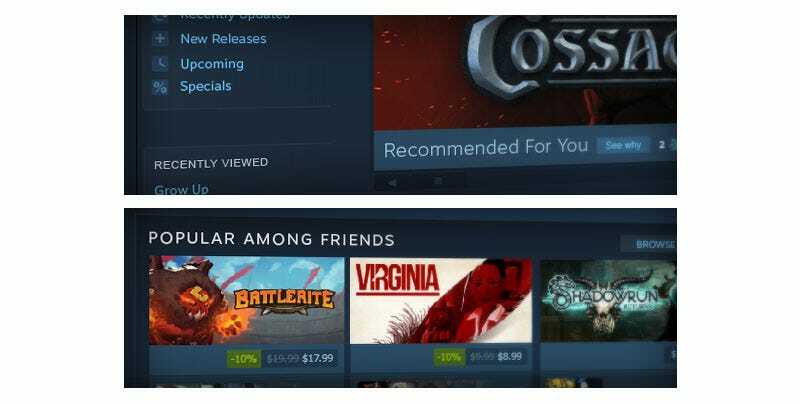 Steam developers were given a heads-up over the weekend that Valve’s online marketplace is about to be getting some much-needed changes to the way it displays games and new content. While the post on Steam itself is private and restricted only to developers, NeoGAF user Nzyme32 has shared its contents on the messageboard, and they detail stuff like a “visual refresh” for the main store page and fresh attempts at tailoring Steam’s recommendations to stuff you might actually be interested in. Home Page Visual Refresh: The Steam home page will be getting a visual refresh to use bigger game images in some places, add some new ways of surfacing games, and remove some visual clutter. Friends Activity: We’re adding a prominent new ‘Popular Among Friends’ section right to the home page that will highlight what your friends have been buying and playing. More Steam Curator Options: We’ve noticed that more than a few Steam Curators are using the curator feature to provide valuable information about games, while not necessarily recommending the title. We’re going to give Steam Curators the tools to indicate whether their post is recommended, not recommended, or simply informational. This helps us better understand whether a curation should be used to promote a game on the front page of Steam, or if it’s intended to be informational that should primarily appear on the individual product page.